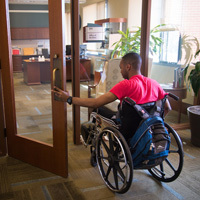 The University is again participating in this year's Workforce Recruitment Program, which connects federal employers with college students and recent grads with disabilities eager to prove their abilities in the workplace through internships or permanent jobs. Eligible candidates from all majors and degree programs, ranging from college freshmen to recently-graduated students, must register by Oct. 11, 2017. The Career Planning & Development Center partnered with the Academic Resource Center to host a Career Readiness Round Table Discussion April 10. Tina Vinson, director of community outreach for Starkloff Disability Institute, was on campus for a lunchtime discussion with soon to be Webster graduates with disabilities. Each semester, students with documented disabilities request accommodations that provide equal access to classroom materials and learning experiences. At the St. Louis area campuses, and for students enrolled exclusively online, the ADA coordinator provides and implements accommodations. At extended sites, it is the responsibility of the site director or staff designee to provide accommodations for students enrolled at that site.